NOKIA 7 announced with 5.2" screen, Snapdragon 630 processor and Bothie camera. HMD Global, the home of Nokia phones, today announced Nokia 7, in China. 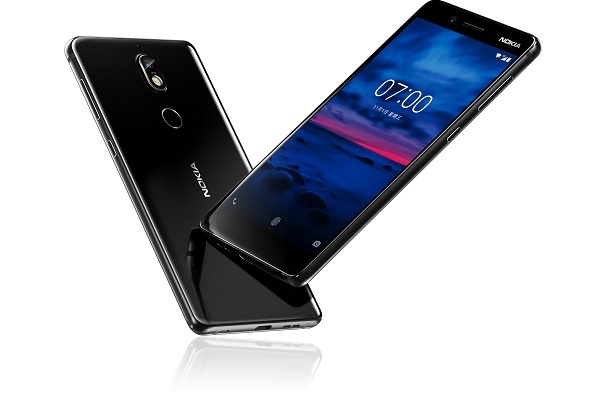 The Nokia 7, powered by the Qualcomm Snapdragon 630 Mobile Platform, is packed with creative tools including; a ZEISS imaging experience with Dual-Sight technology, highly sensitive cameras to capture crisp imagery even in low light conditions and Nokia OZO Audio to record immersive sound. Nokia 7 features 5.2" screen and 7.9mm slim body. It also features an integrated fingerprint sensor, positioned on the back of the phone, and will be available in Gloss Black and Matte White. Nokia 7 delivers a clean Android experience, with no skins or UI layers. It features the latest Android Nougat 7.1.1 operating system (upgradable to Android Oreo in the future). Monthly security updates help keep your Nokia 7 secure. Nokia 7 comes with power-efficient Qualcomm Snapdragon 630 Mobile Platform, which has been seamlessly integrated to maximise performance and battery life, enabling features like Dual-Sight. The Nokia 7's 7000 series aluminium chassis adds strength and beauty with diamond cut bevelled edges. It also features a thermally formed, vacuum moulded Corning Gorilla Glass front and back to deliver a strong, pocketable smartphone with a sleek silhouette. There are two sides to every story and the Dual-Sight feature of Nokia 7 is designed to help you create and share the full picture. Both front and back cameras capture wide angles and have great low-light performance for outstanding images in varying conditions. The 16 MP rear camera is equipped with powerful ZEISS imaging technology to enhance your storytelling experience. Content creators can capture truly unique #Bothies through the Dual-Sight functionality without having to leave the camera app. Nokia 7's wide angle primary camera captures 4K video recording at 30 fps, meaning moments can always be captured in stunning ultra-high definition. And thanks to Nokia OZO Audio, which captures sound in incredible detail with playback on any device or web service, you can enjoy high-fidelity surround sound and re-live all your memories. Nokia 7 will be available to buy in China from 24 October for ¥2,499 ($377) with 4 GB of RAM or ¥2,699 ($407) with 6 GB of RAM. The Nokia 7 is now available to pre-order on JD.com, Suning and Tmall.